Ergonomics combined with space efficient concepts promote increased productivity. For computer intensive environments, Hamilton Sorter's Command Center is the key to better organization, increased productivity and efficiency. Command Center's space efficient design allows you to house more equipment using less floor space. And as your requirements change, our freestanding modular units and easily expandable components make for simple reconfiguration. Cluster Core's modular design and variety of accessories lets you personalize any part of your office. For just one -- or all -- of your workstations, you can choose freestanding pedestals, work returns, overhead shelving, lateral files, and more. To enhance your work flow and office layout, Hamilton also offers receptionist desks, management desks, and material management stations. 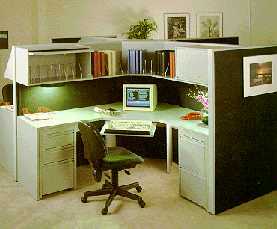 And the beauty of Cluster Core is, you can easily add accessories and workstations as your requirements change. By using a core design to connect a grouping of private work areas, Cluster Core furniture allows you to configure multiple workstations in a minimal amount of space. 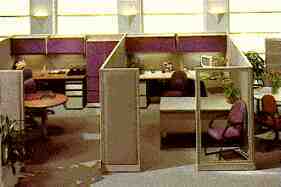 Yet, with Cluster Core furniture, you won't experience the cramped, impersonal feeling you find in many large offices. And when you compare Cluster Core's usable work area with the traditional desk, you'll find up to 30% more work surface in each Cluster Core workstation. Hamilton Sorter recognizes that there's more to an office than simply providing desks for everyone. Using Cluster Core workstations, we can help you create a productive work environment specifically designed for your people. Your office needs. And your budget.